Today was our first day out and about in Darwin. We had errands to run. And guess what? Big Red behaved herself perfectly! Darwin, with a population of 145,916, is the capital city of the Northern Territory. It is also the largest city in a territory which is very sparsely populated. Because it is so far north, the weather is tropical. Winter, however, is its dry season. Which is why we chose this time of the year to be here. It is still a warm 30+ C during the day – but not oppressively humid. Back at home now, we have turned the air conditioner on as we got quite hot being out and about. 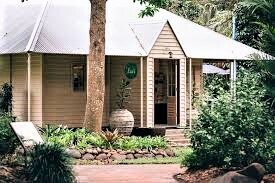 We started the day at the Botanical Gardens with brunch at Eva’s cafe. Formerly a Wesleyan Methodist Church, it has been renovated for its current use. Prefabricated and transported to Darwin in numbered parts in 1897, the building was designed to withstand cyclones, termites and the harsh tropical climate. It has survived 18 cyclones and the WW2 bombing. The greatest damage it has sustained has been due to neglect and vandalism. In order to protect it the NT government decided to heritage list it and move it to its current location. The Botanic Gardens are literally five minutes from Marc’s home. They have been there for 130 years, being one of the few gardens in the world to have marine and estuarine plants growing naturally. We did not have time to stroll around today so will have to go back later. A few essential items were on the shopping list. Those being purchased at a local shopping centre we headed off to Bunnings. Of course! The Retired Husband (TRH) needed ‘stuff’. 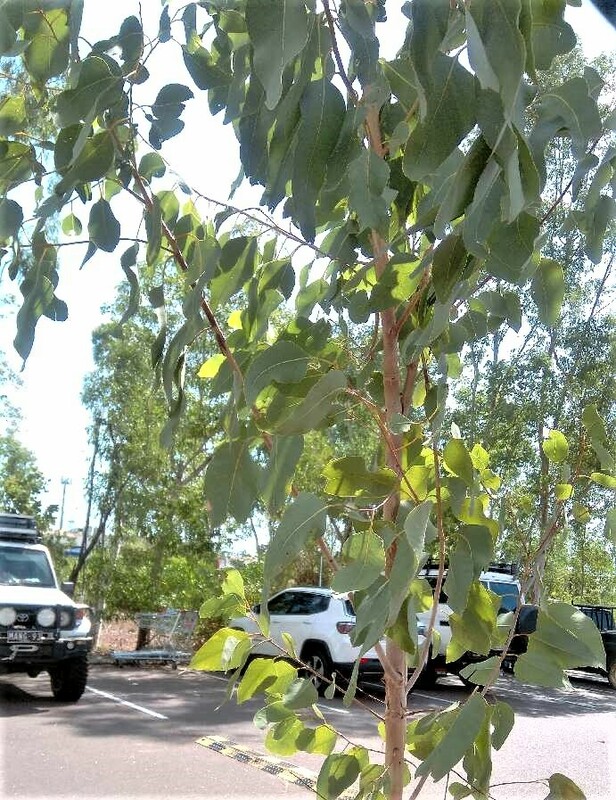 Instead of a photo of yet another Bunnings in yet another city and state of Australia, I offer for your viewing pleasure – a Bunnings car park tree. Being in Australia it is a sapling eucalyptus. Blue Gum I believe, although I am no expert. Blue gum is a common name for subspecies in the Eucalyptus globulus complex, of which there are many varieties. This information I think is far more interesting than the fact that TRH bought some epoxy resin to fix something or other. That, of course, is important. But not as interesting. From Bunnings we headed to a carwash. Big Red was badly in need of a bath having traversed across the outback for days on end. For your viewing pleasure, I present to you a series of images taken through the front windscreen as the cyclonic Auto Wash pummelled Big Red with the ferocity of a cyclone. True. She shivered and shook as much as we did inside, wondering if all her paintwork had been blasted away. But no, she came out shiny red and squeaky clean. Now, we are back home, relaxing in the cool, sipping iced water. Later we will be dining on a smoked salmon salad with a drop or two of the finest. You brought back memories Raili. We liked Darwin. Are you going to feed the fish? Yes, it is on the agenda. Sunset dinner cruise next week. Went to Mindil beach sunset market tonight. Oh good, Ivor, I’m happy to introduce to the delights of the top end 🙂 We went to an evening market by the beach earlier tonight. Will post about it tomorrow. Raili is the yellow place your sons home? Love the colors!!! Yes it is, Linda. Bedrooms are upstairs. Three of them, 2 bathrooms, a large family room. For one person, it’s a huge place. Downstairs is the usual – open plan kitchen, lounge dining, with a an outdoor area, including a small swimming pool. As he works in the Defence Forces, rent is subsidised. Big Red is snug but can you easlly get in and out? Keep having fun…just continue to let us in on some of it.